LA TIMES. Notice I said BASED. That's right, I did not stay true to the recipe. I use recipes as spring boards. In this case, the most important part of any pot pie is the crust and the sauce. I was a bit skeptical of the herb crust but thought why not. This recipe did not fail on either and I am not quite sure I will ever be able to make a pot pie any other way. I highly suggest this to any pot pie lover out there. 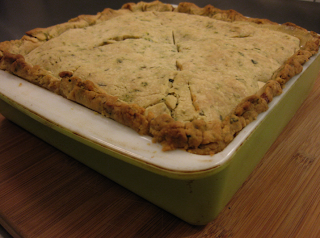 The only thing I did not groove on, was that this recipe only calls for a top crust. WHAT!? Oh no... I need full crust coverage, so you guessed it... I made a double batch of crust... well I actually made 2 batches. 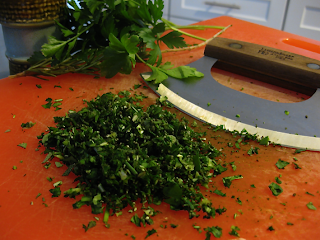 The herb version for the top and a plain for the bottom. I did not want the herbs to be too overpowering. Depending on the size pan you use, you may have a bit of filling left over. Not to worry. Simply place it in an airtight container and freeze. In a few weeks simply heat it up and serve on biscuits or toast with a salad. TA-DONE! 1. In a large bowl, mix together 1 1/2 cups flour, the herbs, a scant half-teaspoon salt and the sugar. Cut 8 tablespoons (one stick) butter into one-half-inch pieces and, with a pastry cutter, two knives or your fingers, quickly work the butter into the flour until it is reduced to pea-sized pieces. Sprinkle ice water, 1 teaspoon at a time and no more than 6, into the mixture and fluff with a fork until the dough is just moist enough to gather into a ball. Do not overwork the dough. Flatten the ball into a disk and cover tightly with plastic wrap. Refrigerate at least 30 minutes to chill thoroughly. 2. 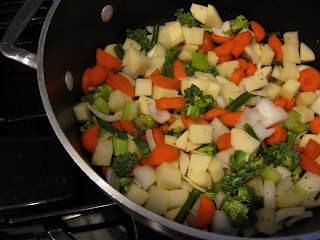 Meanwhile, in a large saucepan, add all the veggies to broth and bring to a simmer over high heat. Reduce the heat to maintain a bare simmer about 10 minutes. 3. Drain the vegetables, reserving the broth. Hold veggies to side until needed. 4. Measure the broth you have left. You should have about 2 1/2 cups left. If more then simmer until reduced. If less then add more stock. 5. 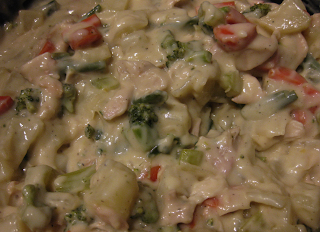 Make the sauce:In a medium heavy-bottom saucepan, melt the remaining 6 tablespoons butter over medium high heat. Sprinkle the remaining 1/2 cup flour over the melted butter and cook, stirring constantly, to make a white roux, about 3 minutes. Do not let the roux color. Off heat, whisk the reduced broth into the roux, then stir in the half and half or cream and bring to a gentle boil stirring constantly. Cook just until the mixture coats the back of a spoon, about 3 minutes, stirring constantly. Remove from heat and season with salt to taste and one-eighth teaspoon pepper, or to taste. 6. 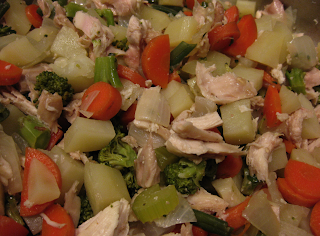 Pour the veggies and cubed turkey into the sauce. Check the seasoning, and set aside. Heat the oven to 400 degrees. 7. On a lightly floured board or surface, roll the plain dough so it is large enough to cover the bottom and sides of a 9x9 dish. Bake for 10 minutes until set. Remove from oven and cool 10 minutes. 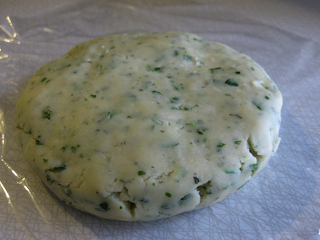 Meanwhile, roll the herb dough so it is large enough to cover the top of a 9x9 dish with a 1" overhang. 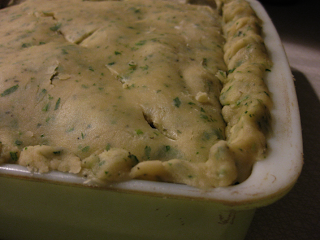 Fill the cooled crust with the filling to top of pan. Drape the dough over the filled dish. Roll up the edges and crimp over the edge to seal the pie. 9. Slit the top of the crust in a few places to allow steam to escape as the pie bakes. 10. Place the pie in the oven and bake for 20 minutes. Reduce the heat to 375 degrees and continue to bake until the crust is golden and the sauce is bubbling, an additional 10 to 15 minutes. 11. Let the pie rest for at about 10 minutes before serving. It will stay warm for quite a long time. I see you too are a proponent of the 2-crust potpie. I don't understand why you would only put crust on top. Makes no sense. Yours sounds as delish as mine! 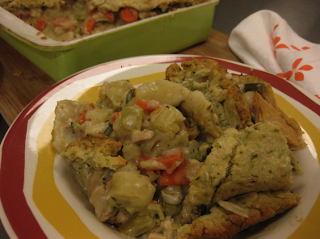 Cheers, and here's to potpie! YES...2 crust or nothing. I mean why bother? Hi Conn, it's Jim Wilder. I just happened upon your blog while searching blogs that listed Auntie Mame as a favorite movie and I just wanted to say hello. From the looks of things, you have created a beautiful life there on Maui, and I am definitely going to try some these recipes. Hope the rest of your holidays are wonderous and that you have a Mele Kalikimaka! What a small world via the internet. Glad you found John and I here at CFC. Hope you have a great holiday season. I was delighted to see Parnell's wonderful artwork on your blog. I passed his blog on to my best friend who is an artist and he was quite impressed. I also had him look at your personal site. He has an aesthetic development/creative solutions firm. John's work is very cool. yeah.. that old hack Parnell... I am lucky enough to have 2 handfuls of his amazing artwork. the 2 in my dining room are 2 of my most prized pieces. Thanks for the link... i'll have a look soon. glad you like johns work too.